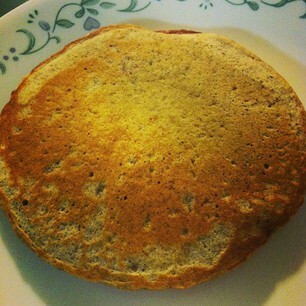 I saw the whole wheat flour on the counter and knew it had to be whole wheat pancakes for breakfast. I searched the web for a recipe and found one here. I did make some changes to the recipe. I did not have wheat germ, so I added flax seed. I also did not use the food processor as it called to do in the recipe. I just melted the butter and mixed all the ingredients in a bowl. But it did turn out really good. My son wasn't much of a fan, but my husband liked them.